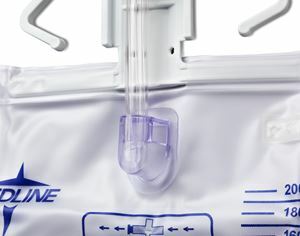 Only Medline drain bags have a slide tap for easy one-handed drainage. All drain bags contain a needleless sample port accessible with either a blunt cannula or luer lock syringe. All drain bags have a reinforced hanger with built-in anti-kink drain tube guide and adjustable bed sheet clamp. Drain bags come with an option of an anti-reflux device. The anti-reflux tower provides anti-reflux protection without mechanical parts to hinder flow. The anti-reflux device has a clear one way mylar valve for visualization of urine flow. The anti-reflux valve flap system minimizes back flow into the drainage tube. Drain bags available with metal clamp or slide-tap drainage port, in 2000 or 4000 ml.